Spring Equinox is this week, but as I’m writing this, snow is falling. Which makes meal planning a little tricky: my taste buds are craving greens and all the good stuff that comes with this time of year, but according to the sky, I have to wait a little longer. Soup is traditional winter fare, but I wasn’t in the mood to stir anything. I was mostly in the mood to stick something in the oven and curl up under a blanket for awhile. This is a situation where casseroles come to the rescue. The creaminess of soup while still heating up the house with a warm oven. This casserole takes all the ingredients of chowder and puts them in a baking dish. It’s a little fussy for a week night dinner, but can be prepared ahead easily. Assembled on Sunday afternoon, you’ll have dinner ready for the oven on Monday. Chowder is hugely popular at my address but the non-clam eaters are more vocal than the fans. Because of this, I swapped out shrimp for the clams. Cooked chicken, scallops or white fish would work just as easily. If you use shrimp, be sure to use raw ones. Cooked shrimp will turn rubbery if they bake in a hot oven for half an hour. This recipe starts like soup, but rather than everything being added to a pot, it all goes into a baking dish where it gets topped with buttered bread crumbs. To begin, chop onions and celery then saute them with butter or oil until they are soft. Don’t rush this step, it will take about ten minutes. While that’s going on, dice and boil the potatoes. I left the skins on mine because I am both lazy and like the color. I used red potatoes, which have a very thin skin. If using russets, consider peeling them first. The smaller the potatoes are diced, the more casserole-like the final dish will be. I chopped my potatoes in slightly larger pieces, but I also like a more rustic texture to my casseroles. Once the vegetables are soft and the potatoes are boiled, toss everything into the baking dish and pour the milk over the whole thing. Top with the buttered bread crumbs and bake uncovered for 30 minutes or until bubbly. The end result will be a creamy, hearty dish that’s not too filling. For variations on the theme, consider adding sliced zucchini or squash, using a mix of purple and yellow potatoes or a blend of seafood. Casseroles tend to be very forgiving, as long as you stay away from the canned soup. 2. In a skillet, melt 4 tablespoons of butter over medium-high heat and add the celery and onion. Saute for 10 minutes or until the vegetables are soft. Set aside. 3. Meanwhile, put the potatoes in a pot with enough water to cover and cook until tender, about 15 minutes. Drain and put them in the baking dish. Add the vegetables and meat to the dish along with the salt, pepper and thyme. Mix together. 5. 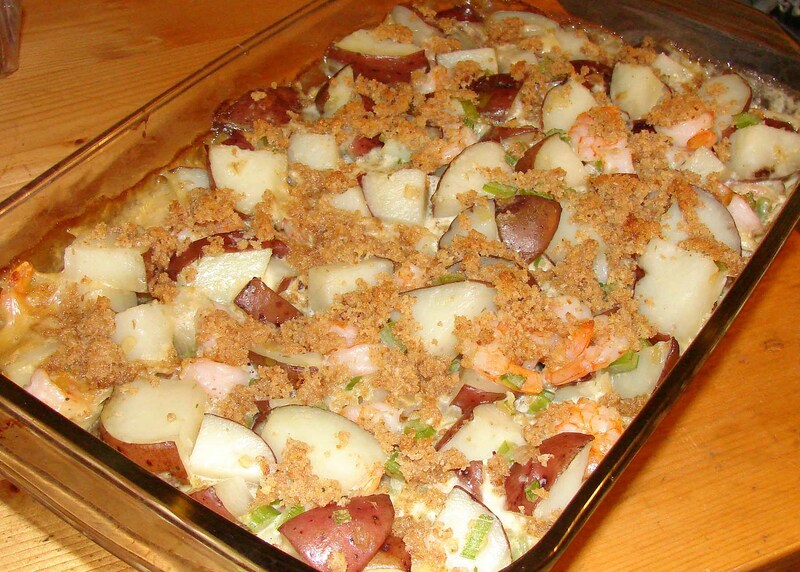 In a small bowl, mix the remaining butter and breadcrumbs together, then sprinkle over the casserole. Bake, uncovered for 30 to 35 minutes, until bubbly.